These are really great for hard wood floors. They do have extra comfort and do not slip as stated in advertisement. They washed well too and kept their non slip. Add style and functionality to your home decor with a pad for your area rug. Featuring a cushioned polymer coated polyester construction, this rug pad will help to prevent scratching of your floor and extends life of any area rug. Dimensions 90.0 In. X 56.0 In. X 0.12 In. I'm currently using this pad under three area rugs/runners (also purchased here at O.CO) in our home. The pads are easy to handle, cut to size if needed, and don't change the original thickness or feel of the rugs. They do just what I want them to do: Protect the area rug and keep it from slipping around. I have not been able to beat O.CO for value and selection anywhere and the customer service is top notch, also. We love the way our rug stays in place with this particular rug pad. It does not move at all. And this pad gives extra cushion to the rug as well. I do recommend this rug pad for anyone looking. Always purchase this kind of pad for my area rugs. Provides just enough height to add comfort, without making an already-thick pile rug a tripping hazard. Also enables me to trim the pad to fit often slightly odd-sized hand-made rugs. The rug pad is excellent, it has been keeping the carpet on my hard wood floor in one area for over 2 yrs. It is definitely a great buy and also good protection on my hard wood floor. I've used this pad under my dinning area rug and it has stayed in place even though it is on a slippery laminate surface. This has been great in adding a little cushion to our rug. It has also been great in holding our rug in place. So many times I feel like the rug pads don’t work well, but this has been fantastic. These are a little more cushioning than some of the other mats and they do work well to keep the rugs in place and us from slipping on them. It's a nice pad, fit my 8' rug perfectly. I've help a few people move and I struggle with using a pad or not, salespeople swear by them and floors look great after not having one. This pad is quite effective to stop slipping, and I assume for protecting the rug. I cannot buy in bulk for less than they sell at Overstock. Does a good job keeping the rug in place. Did exactly what is was advertised to do. I really prefer having these under carpets than using carpets without them. Makes the carpet much safer. Very thin but does a good job of holding rug on a hardwood floor. "I need a leak proof , moisture resistant rug pad for my 6' by 9' rug. I have pets & a delicate floor. None of the pads shown indicate they have a moisture barrier"
"I have an area rug over my wall to wall carpet. Will this work and keep the area rug from slipping and bunching up?" Yes, this will be perfect to prevent slipping and bunching up. "How think is this pad?" Thank you for contacting us 5dog3bird. This particular rug pad is approximately 3mm +/- thick. Please let us know if you have any further questions. Hello genehull, thank you for your interest in the Comfort Hold White PVC-coated Knit Polyester Rug Pad (9'6 x 13'4). 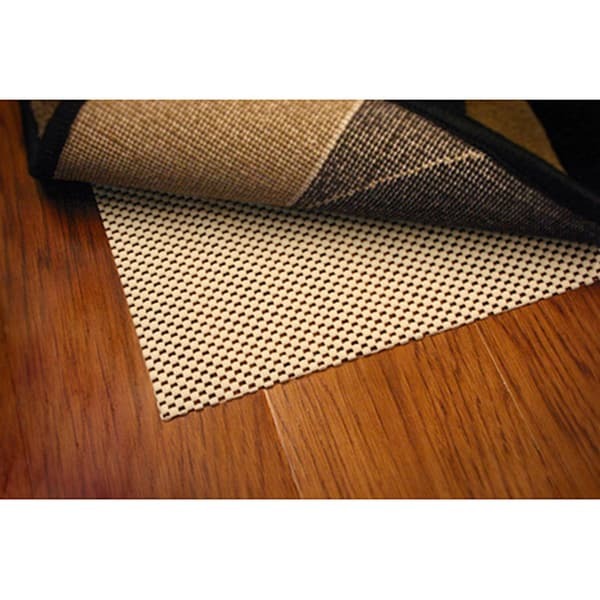 This rug pad is designed for indoor use. Thank you for shopping with us, and have a great day! "Can you please post the actual full size picture of this item?" Hello m123456m1234! These rug pads are so helpful! Unfortunately, this is the only image we currently have available. I apologize for the inconvenience. Thanks for shopping with us.